Street vendors are part of the lifeblood of the historically migrant communities of Flatbush and East Flatbush. Street vendor are currently fighting an increaae in racial profiling and police harassment due to gentrification. We the undersigned value the street vendors in our community and want to see them thrive. Street vendors provide unique and vital services that we as community residents heavily rely on. The vast majority of street vendors are Flatbush and East Flatbush residents who shop and send their children to school in this community. They are our neighbors. We are against the current NYC policy that prohibits street vendors to be on Flatbush Ave between Parkside Avenue and Avenue H from 7am-7pm Monday through Saturday. We want the Flatbush Business Improvement District and the NYPD to know that we denounce the economic harassment and racial profiling that is currently happening to street vendors in our neighborhood. Stop the harassment of street vendors of Flatbush and East Flatbush. Lxs infrascritxs apreciamos a lxs vendedorxs ambulantes de nuestra comunidad y queremos ver que prosperen. Lxs vendedorxs ambulantes proporcionan servicios únicos e imprescindibles, de los cuales dependemos lxs residentes de esta comunidad. La gran mayoría de lxs vendedorxs ambulantes viven y hacen sus compras en Flatbush y East Flatbush, y sus hijxs estudian en esta comunidad. Son nuestrxs vecinxs. Nos oponemos a la política actual que prohíbe la venta ambulante en la Flatbush Ave entre la Parkside Avenue y la Avenue H de las 7am-7pm de lunes a sábado. 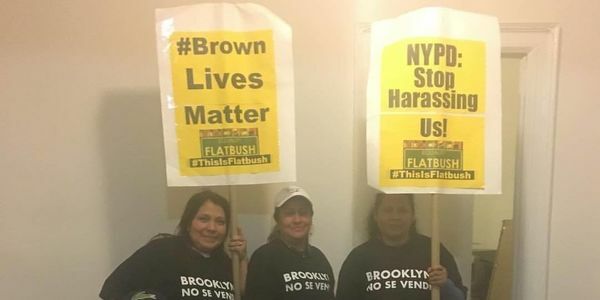 Queremos que sepan la Asociación de Comerciantes de Flatbush (Flatbush Business Improvement District) y la policía que rechazamos el hostigamiento económico y la discriminación racial que están sufriendo lxs vendedorxs ambulantes en nuestro vecindario. Alto al hostigamiento contra vendedorxs ambulantes de Flatbush y East Flatbush.